Beautifully updated and well-maintained custom home on a cul de sac in a quiet West Plano neighborhood. Close to shopping, dining, multiple grocery stores, and all the conveniences. Neutral palette, natural materials, an abundance of rich architectural detail, and richly stained hardwoods through-out. Great floorplan for entertaining. Large formal living plus two additional living areas, walk-in wet bar, formal dining and breakfast room. Wonderfully private backyard oasis with built-in kitchen and granite counter-tops and bar. Replastered pool and spa with new water feature. Oversized master on main with fireplace and large updated bathroom. Large utility room with hanging space, built-in cabinetry and shelving, and counter space for folding. Dog run with dog door from utility room. Two walk-in decked attics for storage. The large attic space adjacent to the 2nd bedroom can be finished to create a large media room. Access would be at the top of the stairs and to the left. The homeowner has put over $190,000 in improvements and updates over the past 3 years. Roof and gutters replaced 2016. Both HVAC units and ductwork replaced 2017. Please refer to list of updates and improvements for more detail. Ideally located in the sweet spot of West Plano with convenient access to North Dallas Tollway, Sam Rayburn Tollway (SH-121), and Central Expressway (75). Visit www.3817Manchester.com for listing photos and property details. 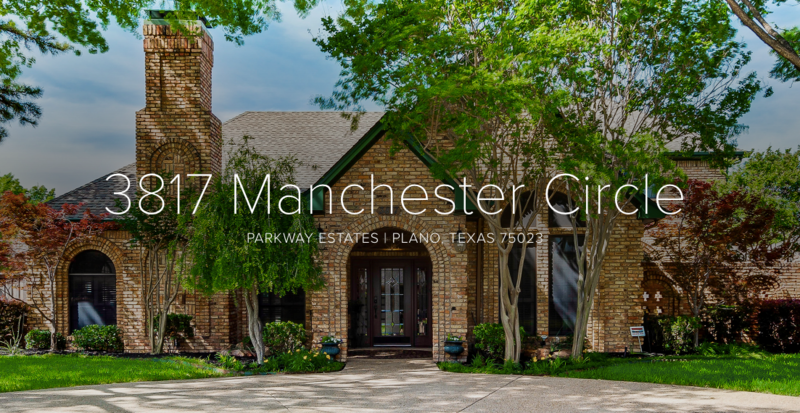 3817 Manchester Circle Plano, TX, 75023 from Home Snappers Photo and Video on Vimeo.